Sunlover Reef Cruises is dedicated to the preservation of this World Heritage Listed natural wonder by embracing Best Environmental Practices. In 2004 Sunlover Reef Cruises generously donated a small portion of land to the Turtle Rehabilitation Centre to build a rehabilitation facility to nurse sick and injured turtles back to health. Sunlover continues to support the Turtle Rehabilitation Centre from a range of tshirts sold on board, and by making a direct contribution to the welfare of these amazing creatures. They have held several turtle releases at the pontoon, and also provide free transfers for the Turtle Rehabilitation staff and associated media personnel in order to participate in the necessary turtle releases in the area. 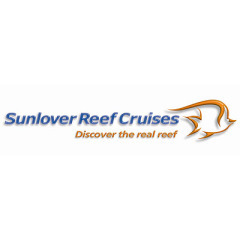 Sunlover Reef Cruises is an Ecotourism Certified operator. The ECO Certification program assures travelers that certified products are backed by a strong, well-managed commitment to sustainable practices and provides high quality nature-based tourism experiences. Sunlover Reef Cruises strives to educate all guests on the importance of preserving the Great Barrier Reef and its inhabitants. They advise guests of key ways that they can contribute to the Great Barrier Reef’s protection and preservation. 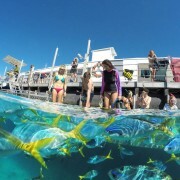 These include: observing the marine life in its natural environment rather than touching or handling; never standing on the coral while snorkeling or diving; disposing of rubbish in the bins provided around the vessel and pontoon; and, when applying sunscreen, ensure that the cream/liquid is absorbed before entering the water.